The revival of the Howard Theatre brought worry that our newly revived venue would follow the disappointing path of the Lincoln Theatre on U Street. 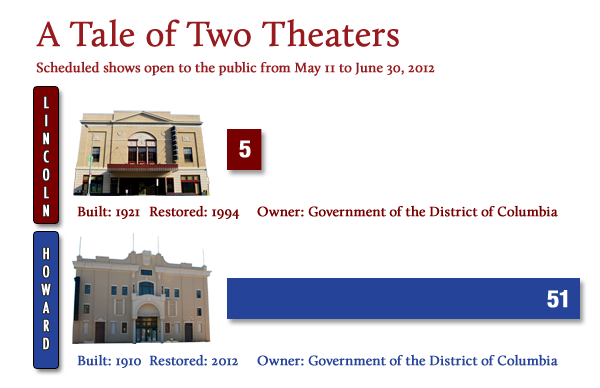 After all, both theaters were built in the early 20th century, both are owned by the DC government, and both are located within a short walk of each other. A glance at both theaters’ online schedules reveals that their fates have sharply diverged. From now until the end of June, the Lincoln Theatre has 5 events scheduled while the Howard has 51. This glaring disparity shows the importance of selecting the right management team. The District chose the experienced Blue Note Entertainment Group to run the Howard while it chose the non-profit U Street Theatre Foundation to run the Lincoln. The mayor’s office rightly revoked U Street Theatre Foundation’s contract for the Lincoln as the theatre was careening toward bankruptcy at the end of 2011. The mayor has tasked the DC Commission on the Arts and Humanities with finding a new operator for the Lincoln. The greater U Street area is a regional arts venue. The Howard Theatre, the 9:30 Club, U Street Music Hall, the Black Cat, Bohemian Caverns, Twins Jazz Club, and numerous performance-oriented bars provide an amount of live performance space most cities would envy. But when we compare the success of these venues to the fiasco of the Lincoln Theatre, it becomes clear that something is terribly wrong in the District’s stewardship of this resource. If all of these venues can thrive, so can the Lincoln. The previous management of the Lincoln should be investigated. Compared to surrounding smaller venues, the Lincoln should have done better. But then again the District Government has a habit of awarding contracts to non-profits that don’t produce or have no clue what the heck they are doing. I’m not so sure the management team at the Howard is any better. They are ill equipped to really service the needs of the customer. A great number of their “featured services” are still coming soon. TREMENDOUS inflexibility to handle small requests. If it’s outside of their scope of understanding, it’s not happening. This is touted as an upscale venue. However, who would want to stand in line 30 minutes to an hour before an event just to be herded through like cattle to rush for a seat. I’d like to be able to reserve my seat and ticket, arrive at the designated time, and enjoy the event. Until the policies change, I won’t be patronizing this establishment. I think your view of “being rushed through like a herd of cattle” is way overly exaggerated. In my experience at the Howard the security staff has been phenomenal in how they handle the lines and the crowds. If you knew any history of the operational group of the Howard you would know that that’s just how this venue works. Its first come, first seated. If you want a better seat you actually need to make an effort for it. Otherwise I think if at the minimal we need to thank the management team and the developing group for bringing back our beautiful Howard theatre to its shining lights again. I was at the Howard last night for the first time. It’s a great venue, but being seated at chairs and tables for a rocking blues show really stifled the show. The Howard should tailor the seating for the type of show playing. Kenny Wayne Shepherd rocking Texas blues should have a different set-up then a jazz show.